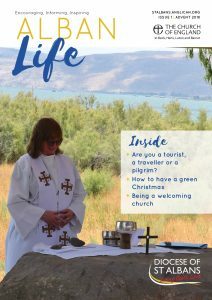 This article by The Revd Peter Crumpler is the main feature of the Advent 2018 edition of Alban Life Magazine, which is distributed to parishes quarterly. Do pick up a copy from your local church. The three-part BBC Two series ‘Pilgrimage: The Road to Santiago’ followed actor Neil Morrissey, singer Heather Small, TV and radio presenter Rev Kate Bottley and four other would-be ‘pilgrims’ as they tackled part of the grueling medieval pilgrimage, the Camino de Santiago. On the way through Spain, the pilgrims had lively religious and spiritual discussions and told their stories of self-discovery. As I watched the series, I wondered how the pilgrims would get on. How would they fare with the tough days of walking, the basic accommodation, the heat and having to be in each other’s company for day after day. I also wondered whether I’d stay the course – was this really going to be engaging TV viewing? But the series worked. It worked because you entered into the lives of the very different people on the pilgrimage. You heard their stories. You saw them debating what they believed about faith and all kinds of other things. You saw them struggling with the physical challenges – and ultimately making it through to their destination. Sometimes TV can be very different to real life. We watch a TV detective series and say “I can’t believe that would happen.” Or we watch a documentary and it takes us to places that are far beyond our daily experience. But ‘Pilgrimage’ made me reflect on my own life. On my journey through more than six decades. Can I look back on all that’s been part of my experience, and see how that journey has led me to this place? To where I am now? In the gospels, Jesus was constantly on the move. He taught his disciples on the road, he healed people as he came across them while he moved from place to place. He taught and had life-transforming encounters with people in one setting, before moving on to another. So it is with each of us. We move on from one place to another, from one phase of life to a new phase: life as a journey, life as a pilgrimage. For the past five years, I have been a Christian minister based at St Leonard’s Church, Sandridge, just north of St Albans. The 900-yearold church is sited on many routes popular with ramblers and dogwalkers. It’s also close to Heartwood Forest, a new forest of more than half a million trees being developed by the Woodland Trust, and one of their most popular sites. The poster declares the welcome the church wants to offer to everyone. But it also makes clear how journeying is part of life. So some of those ramblers drop in to look at the church, have a quiet moment of reflection or prayer and then go on with their journey. The church is, if you like, a resting place on their journey or pilgrimage. For me, I can trace key moments in life when God has been especially close to me. My wedding day, the birth of our children and grandchildren, my father’s death. Yet I can also experience him in the everyday and through other people. Because pilgrims seldom travel alone, just as the TV pilgrims were in a group of seven, so we travel through life with others. A year or so ago, I joined a pilgrimage to the Holy Land, organised by St Albans Diocese. 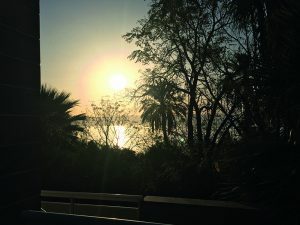 I loved watching the sunrise over the Sea of Galilee, and to sail across it on an open boat. I appreciated walking in old Jerusalem, and thinking that Jesus would have walked the streets around here. In my mind, are so many pictures and memories. Yet some of the clearest recollections are of the people we travelled with, our fellow pilgrims. As we travelled together, ate together, took in new sights together, we shared our experiences and we talked about our lives. We told our stories and talked about how we came to be on this pilgrimage at this point in our life’s journey. When I look back, I recognize the people who have been present with me, who have walked the journey alongside me. Family and friends, work colleagues and bosses, church leaders and fellow Christians. The good advice I have received, some taken, down through the years. 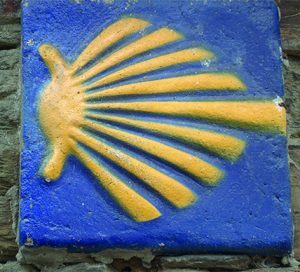 Earlier this year, a friend of mine undertook the same route as the TV pilgrims on the road to Santiago de Compostela in Spain. He went with a group., but he also took with him – via social media – his family and friends. So we received regular updates online, saw video clips, witnessed many of the sights he was seeing, and experienced something of the tough physical challenge. We shared in his rejoicing when he finally arrived in the city’s stunning cathedral. Hundreds of years after Chaucer wrote about his pilgrims heading for Canterbury, the latest online technology is opening up pilgrimage to new generations. Pilgrimage for me is about journeying through life. It’s about growing spiritually as we grow older and perhaps wiser. It’s about travelling with others around us, sharing their stories and learning from them. As today, increasing numbers of pilgrims are travelling to St Albans and other historic centres of pilgrimage, I pray that they will experience the God of yesterday, today and tomorrow with them on their journey.